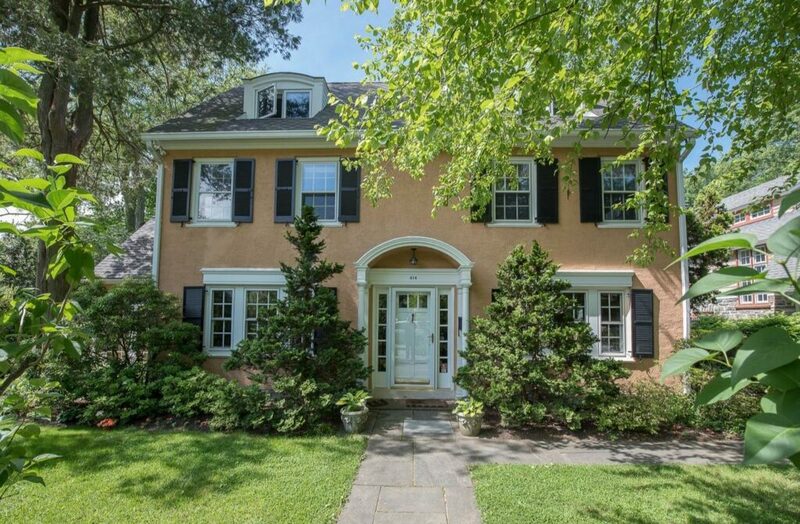 Beautiful Haverford ‘Maisonette’ center hall colonial with formal, elegant floor plan, bright and sunny reception rooms of scale, private, beautiful gardens, a private driveway w garage. Property has house of five bedrooms and is located in the most popular and most walk-to street location in all of Haverford. Neo classical portico, front door and front elevation have grandeur from a bygone era which lends impressive curb appeal. Foyer has hardwood floors, transverse stair, radial arch to back alcove for coat closet, powder room and basement stairs. Living room has hardwood floors, modern lighting and oversize brick fireplace. Enclosed East porch is a solarium w tile floors, built-ins and three doors out to gardens. Full size dining room has hardwood floors, elegant trim moldings, accent lighting and sunny windows. Petite cherry kitchen has tile floor, island, is eat-in and has back door to patio and garage. Second floor has three spacious bedrooms, one w and an alcove; all with nice closets and pretty windows, a modern full bath, sun porch. Third floor has second full modern bath and two pretty family bedrooms, both with windows and closets. Unfinished lower level has laundry and mechanicals, stairs to bulk head doors out, and storage. Great Condo Alternative! Walk to the Haverford SEPTA train station, all of Haverford Square and the White Dog Cafe, Haverford School and College campuses and facilities, Green Engine Coffee House, MCC or Roche & O’Briens!